The Lubar Institute for the Study of the Abrahamic Religions closed in June 2016. This web site will not be updated, and remains online as part of the University of Wisconsin–Madison’s public archive. “A season is set for everything,” Ecclesiastes tell us, including “A time for planting and a time for uprooting [what has been] planted” (3.1, 2). The Lubar Institute for the Study of the Abrahamic Religions was sown in 2005; the time for pulling it up has come. Having lost our major funding, we can no longer maintain our programs at their accustomed level and quality. As a result, we will cease active operations by the end of June 2016. Founded “to create better understanding of the Abrahamic traditions and their interrelationships by encouraging ongoing discussion of these traditions among scholars, members of those traditions, and the general public,” the Lubar Institute has sponsored scores of events and publications: international conferences, art exhibitions, colloquiums, lectures, interfaith forums, workshops with primary and secondary schoolers, books, and student journals. Each project was designed to foster greater understanding of the Abrahamic religions, and to ratify the values of religious tolerance vital for thickening the bonds of American civil society. We have sought to broaden conversations across academic disciplines and faith traditions, between believers and non-believers, and, in upholding the Wisconsin Idea, striven always to mingle campus and community by involving the general public. I hope that the Institute has challenged you to think more easily about Judaism, Christianity, and Islam as a family of interconnected traditions and to engage more confidently with people beyond your usual networks. But while Ecclesiastes references “A time for tearing down,” it also promises “a time for building up” (3.3). Under a new name and director, the Institute’s work will resurface in the summer of 2017, when the UW–Madison Center for Religion and Global Citizenry, headed by Rev. Dr. Ulrich Rosenhagen, will develop new programs targeted to “increase UW–Madison students’ religious literacy and their facility for communicating across boundaries of faith so that they may function effectively as citizens of a religiously diverse world”—an extension of the Lubar Institute’s corollary policy announced in 2013. Please watch religion.wisc.edu for information about the new Center. My gratitude is boundless, but space is limited, so I can mention only a few people by name. Sheldon and Marianne Lubar deserve the place of honor for envisioning the Institute and supporting it for over a decade. Associate Director Ulrich Rosenhagen, along with Graduate Fellows Ovamir Anjum, Rohany Nayan, and Tayyab Zaidi, and Academic Fellow Ibrahim Saeed, shaped our programming and offered intellectual heft. Karen Turino, Meg Hamel, and Sari Judge provided superb staff support, as did Mel Charbonneau, Ariana Horn, and Brad Klingele. Numerous colleagues offered scholarly counsel as members of the Faculty Steering Committee; others, along with members of local Jewish, Christian, and Muslim communities, served on the External Steering Committee, which extended the Institute’s reach far beyond campus. Dean Karl Scholz and Associate Dean Susan Zaeske of the College of Letters & Science fully embraced the Institute within their vision of the liberal arts. I am especially proud of the Interfaith Student Fellows—the Institute’s longest-running program, and the one likely to have the most enduring impact. To everyone who participated in a Lubar Institute event, thank you for your time and expertise. To everyone who attended one of our functions, thank you for your interest and support. To everyone who contributed their love and labor to the Lubar Institute over the years, thank you for my transformation. The Interfaith Fellows are a selected group of students at the University of Wisconsin–Madison. Representing the Abrahamic faiths of Islam, Judaism, and Christianity, the students met weekly with Lubar Institute staff to talk about religion, participate in campus and community activities, and develop interfaith leadership skills. 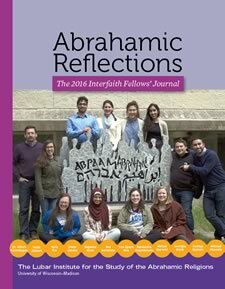 Abrahamic Reflections collects their end-of-year reflections on their involvement with the group. Read the 2016 Journal as a PDF file here. Watch the video story of the Lubar Institute.